This month’s Practice Management feature article, Perfecting the Consumer Financial Experience in Your Urgent Care Center, reveals that with increasing flexibility in accessing healthcare, patients also want more flexibility when it comes to paying their bill. Their insurance status comes into play, as do methods of payment. It’s been suggested that such details may even play a part in choosing where they go when they need to see a provider. As such, it could be to your advantage to let them know this type of information before they walk through your door. Making it easy for them to pay can help with collections, as well, according to the Urgent Care Association’s 2018 Benchmarking Report. 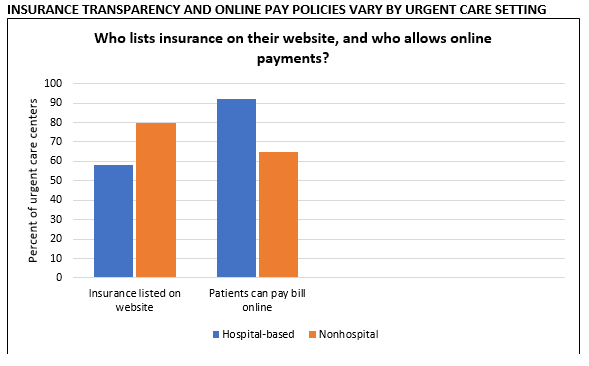 Interestingly, as you can see below, hospital-based urgent care operators are more likely to allow patients to pay their bill online, while more nonhospital urgent care centers tend to list insurance details compared with their counterparts. Source: Urgent Care Association 2018 Benchmarking Report, based on Merchant Medicine analysis. For more information, visit https://www.ucaoa.org/Resources/Industry-Reports/Benchmarking.